Yes, it's the first smiley face (together with a frowny face), now classified as an emoticon. The message was long considered lost, until it was recovered from backup tapes five years ago. At the time of the recovery, ZDNet UK reported that "the date 19 September, 1982, is now likely to join the lexicon of other significant dates in the information revolution." And sure enough, the fanfare for the 25th anniversary has been ample. 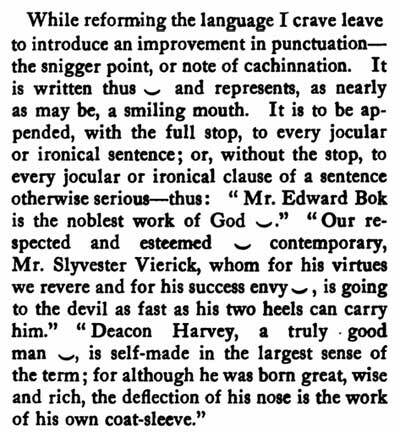 Despite the significance of Fahlman's world-changing combination of three punctuation marks, there were actually a few predecessors in earlier decades, proto-emoticons if you will. Many people write letters with strong expression in them, but my Aunt Ev is the only person I know who can write a facial expression. Aunt Ev's expression is a symbol that looks like this: —) It represents her tongue stuck in her cheek. Here's the way she used it in her last letter: "Your Cousin Vernie is a natural blonde again —) Will Wamsley is the new superintendent over at the factory. Marge Pinkleman says they tried to get her husband to take the job —) but he told them he couldn't accept less that $12,000 a year —) "
Nabokov: I often think there should exist a special typographical sign for a smile  some sort of concave mark, a supine round bracket, which I would now like to trace in reply to your question.